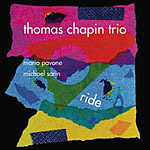 Recorded live at the Netherlands' North Sea Jazz Festival in 1995, Ride captures Thomas Chapin's legendary trio at the height of its powers. Sharing the bill with such notable masters as Jackie Mclean, Roy Haynes, David Murray, Fred Hopkins and Andrew Cyrille inspired the trio to play with extra enthusiasm. This seven-track program, consisting of the late NYC multi-instrumentalist's most memorable tunes, features some of the trio's most energetic performances, making it one of their most engaging live recordings. Chapin briefly plays sopranino sax and flute, but he tends to favor his trusty alto sax. Two long-term partners, bassist Mario Pavone and drummer Michael Sarin, push and pull at these structures with knowing restraint. Each an inventive and sympathetic accompanist, they are given ample solo time, but this is definitely Chapin's show, and he never sounded more assured than he does here. Playing in the company of peers and idols, the trio pulls out all the stops on a set that rages full-speed ahead, with few stops along the way. "Anima" and "Night Bird Song" are extended improvisations with epic dynamic sweep and melodic development. "Bad Birdie" and "Changes Two Tires" are shorter, burning up-tempo pieces; "Pet Scorpion" is heard here for the first time on record. Animated and bright, full of hairpin turns at a breakneck pace, this is an excellent addition to Chapin's songbook. The set's only detour arrives in "Aeolus," a showpiece accentuating Chapin's euphonious flute variations. But the calm only arrives after the storm. Opening with a flutter-tongued cadenza full of hoarse multiphonics and hair-raising screams, Chapin takes the innovations of Rahsaan Roland Kirk a step beyond. The trio's closing cover of the Beatles "Ticket To Ride" is a rousing sendup of a familiar theme, complete with a brash punk rock attitude. A master technician and creative melodist, Chapin was taken from us far too soon when he succumbed to leukemia in 1998 at age 40. Numerous saxophonists still reference his signature biting timbre and frenetic linear attack. Though loosely considered a "free" player, he was far more interested in lyrical development and rhythmic structure. Hearing him weave through these pieces, spinning minor melodic variations over and over again, reinforces his stature as one of the past century's master improvisers. Ride is overflowing with some of Chapin's finest playing on record. It's an excellent entry point for novices to discover one of the best jazz trios of the late 20th Century. Track Listing: Anima; Pet Scorpion; Night Bird Song; Aeolus; Bad Birdie; Changes Two Tires; Ticket To Ride. 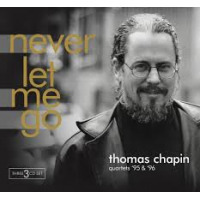 Personnel: Thomas Chapin: alto saxophone, sopranino saxophone, flute; Mario pavone: bass; Michael Sarin: drums.